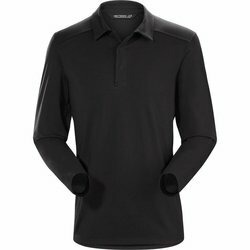 ARC'TERYX Captive LS Polo. Merging contemporary urban style with proven Arc'teryx performance, the long sleeve Captive Polo travels from bike commute to the office. Made from Arc'teryx Salient with DryTech cotton polyester blend fabric, the Captive comfortably wicks moisture and is just the right weight for shoulder season weather. The laminated placket with hidden snaps adds refinement, and reinforced side vents are taped for longwearing durability.